This is the high-stakes matchup the AFC has been building towards for years. It's a rubber match as Andy Reid's Chiefs are 2-2 against Bill Belichick's Patriots since 2014. It was a Monday night massacre (41-14) at Arrowhead back in 2014 that led some to believe that the Patriots' dynasty was over. New England rebounded to win Super Bowl XLIX while the Chiefs (9-7) missed the playoffs. In 2015, the teams met in the divisional round of the playoffs in New England, and the Chiefs didn't have the offense to keep up in a 27-20 loss. It looked like a better Kansas City team would return for a rematch in the 2016 AFC Championship Game, but the Steelers ended that season at Arrowhead in an 18-16 game and the Patriots won another Super Bowl. The Chiefs had an impressive 42-27 win in New England to start the 2017 season and should have been the team most likely to win there in January. However, the Chiefs couldn't get past the first round of the playoffs while the Patriots advanced to another Super Bowl. 2018 has introduced quarterback sensation Patrick Mahomes, the early favorite for the face of the AFC's next decade. Now the Chiefs are the league's offensive juggernaut with home-field advantage even after dropping a 43-40 game in New England in Week 6. Last week, Kansas City beat the Colts, finally winning its first home playoff game since the 1993 season. With the AFC Championship Game in Kansas City for the first time ever, the Patriots find themselves in the unusual role of three-point underdogs as they attempt to become the third team to reach three straight Super Bowls (1971-73 Dolphins, 1990-93 Bills). Ever since the Patriots re-branded themselves as an offensive juggernaut in 2007, they have rarely been an underdog with Tom Brady at quarterback. This is only their 18th time as underdogs since 2007 (9-8 game record), and the first time since the 2014 Patriots lost 26-21 in Green Bay. That was another road game against a No. 1 offense in DVOA and a quarterback (Aaron Rodgers) having an MVP season. This is the 39th playoff start for the Brady-Belichick duo, but it is only the eighth true road game. The record is 3-4 in the first seven games; the Patriots haven't won a road playoff game since the 2006 AFC divisional round in San Diego. They have since blown a 21-3 lead to Peyton Manning's Colts (2006) and twice lost to Manning's Denver teams in title games in 2013 (26-16) and 2015 (20-18). Needless to say, the Patriots are looking for their biggest road win in 12 years here. While the Patriots are playing the "us vs. the world" card this week, the fact is that home-field advantage is really the reason why the Chiefs are favored here. Not only are the Patriots just 3-5 on the road with several poor losses this season, but the defense is inexplicably 31st in DVOA on the road compared to second at home. That's bad news against a historic offense led by Mahomes. On the other side, the Chiefs are 30th in defensive DVOA on the road, but 12th at home. They only gave up one score to Andrew Luck and the Colts last week. We'll dig into those splits below, but the fact is that the Patriots are on the road in a game against the No. 1 team in DVOA. In fact, the Chiefs' advantage in team DVOA (+18.8%) is the second-biggest advantage any team has had over the Patriots in 39 playoff matchups since 2001. Only the 2005 Broncos (+20.8%) were higher, and that was a 27-13 win in Denver. The Chiefs deserve to be the favorite this week. We'll make a quick mention of the weather before we get into the matchups. There were reports early in the week that this could be one of the coldest games in NFL history with single-digit temperatures, if not below zero. That doesn't appear to be the case at all now, with Sunday evening looking to be in the 20s with marginal wind. It likely won't be any worse than the flurries and cold the Chiefs played in against the Colts last week, and obviously the Patriots are experienced with such conditions. The Vegas total is holding strong at 55.5 points, which would be the second-highest total in Pro Football Reference's database for a game played in sub-30-degree temperatures. The highest just so happens to be that aforementioned Patriots-Packers game in 2014, where the underdog Patriots lost. Fresh off a bye week, the Patriots looked ready with a plan for the Chargers. They even made the rare move to receive after winning the coin toss, and it quickly led to 35 points before halftime. After getting credit for using seven defensive backs against the Ravens, the Chargers used that again on 42 snaps in Foxborough, but the Patriots ate the Chargers alive with short passes (Brady's 4.1 aDOT was his second lowest of the season) and a strong ground game. Maybe those seven defensive backs should have paid attention to Julian Edelman, who had 151 yards on nine catches despite being the clear No. 1 wideout since Josh Gordon's season ended. The Chargers also had no answers for the running backs as James White caught 15 passes for 97 yards as an extension to the running game. The Chargers played right into New England's hands with their commitment to zone coverage and not blitzing the quarterback. Brady was only hit twice all day and was never sacked. Enter the Chiefs, who just happen to be the defense that the Patriots set season-highs against in Week 6 in points (43), yards (500), and first downs (31). That sounds very promising, though the Chiefs do present a different matchup from the Chargers. Still, the Patriots need to do more of the same this week, where a minimum of 27 points should be required to win. That means a fast start so they can control the pace of the game and stick with the run and play-action to limit Mahomes' opportunities. It's just that on the road the Patriots have not been that sharp this season. New England has already had four wire-to-wire losses this season, tied with 2002 for the most in one year under Belichick. In three of those games, the Patriots only scored 10 points. While some early-season flaws may explain the losses in Detroit and Jacksonville, this still happened in Week 15 in Pittsburgh the last time the Patriots played on the road. The Patriots especially want to run the ball against the No. 32 run defense by DVOA, but those awful game scripts on the road have made it hard for this team to stick with the run. Seven of the eight games this season where the Patriots rushed for fewer than 120 yards were on the road. It's not just the volume that was different either. New England's average rush at home gained 4.50 yards per carry compared to 3.93 on the road -- the 0.57 increase at home was the fifth-largest in 2018. The Patriots just haven't been able to go on the road and dominate on the ground outside of that Week 12 win against the Jets (215 yards) where they had a lot of chunk plays in the second half. Even though Andrew Luck was clearly struggling last week, the Colts didn't have any easy completions to running backs. They didn't have any hard ones either as the Colts were 0-for-2 on targets to backs. The Patriots will certainly top that against a defense that ranked 21st in DVOA against receiving backs. White's 97 receiving yards last week are the fewest in NFL history for anyone with 15 catches in a game, but that's not bad when you think of it as part of the running game. It's usually going to be a pass when White is in the game and a run when Sony Michel is in the backfield, but the Patriots tend to make it work anyway. Throw in some Rex Burkhead and the Patriots have a trio of backs to use this week. In Week 6 against the Chiefs, the Patriots had one of their best rushing days of the season with 173 yards. That night the Patriots also had their highest first down-per-rush rate, (39.5 percent), their most rushing first downs (15), and their designed run percentage from shotgun was a season-high 26.3 percent according to ESPN Stats & Info. They ran very well against the Chiefs, and they'll look to repeat that with Michel leading the way. Last week, the Colts had some effective runs, but thanks to starting the game with four three-and-outs, they trailed by 17 early and had to basically abandon the ground game. The Patriots won't want to abandon the run because of play-action passing. We can save the debates that teams should use play-action more and that you don't need to run well to use it, but even the Patriots won't find it as valuable if the game script goes awry. According to Sports Info Solutions, the 2018 Patriots had the fourth-highest usage rate (29 percent) of play-action and the highest yards per play (9.9) with play-action, but they were only 21st in yards per play (6.3) without play-action. That difference of 3.7 yards in using play-action was easily the largest in the league. Brady was 10-of-12 for 140 yards on play-action against the Chiefs in Week 6. The Chiefs will have to stop the run better, but the easiest way to end drives is still going to be to rattle Brady with pressure. What could be the key in home-field advantage? Noise from the crowd, apparently. Arrowhead is known as one of the loudest stadiums, and here's a stat that can help explain why the Chiefs are statistically solid at home: According to ESPN Stats & Info, the Chiefs have the highest pressure rate at home (36.9 percent), but fall to 26th in road games (25.9 percent). The difference in quality of opponents also explains a lot, but this is significant too. One of the most impressive parts of the performance last week was the three sacks, including a strip-sack, against Andrew Luck. Justin Houston had two of those sacks. He missed the first matchup, so that's a big addition to go with Dee Ford and Chris Jones up front. The Chiefs sacked Brady twice in Week 6, but it was a third-down play where Brady got away from Breeland Speaks for a rushing touchdown that really hurt. Speaks didn't wrap Brady up for fear of a penalty, but the Chiefs are going to have to hit the quarterback often this week. Safety Eric Berry has also been practicing this week and could play in his third game this season on Sunday. Berry helped keep Rob Gronkowski in check in Week 1 of the 2017 matchup when the defense forced Brady into a lot of deep passes. The Chiefs actually have the best DVOA (-49.3%) on passes thrown to the deep middle of the field, so that hasn't been an area of weakness in Berry's absence. The Chiefs could really use someone to check Edelman or Gronkowski over the middle this time around. In Week 6, the Patriots did not have a play longer than 17 yards through nearly three quarters, but Brady finished with five long completions starting with the final play of the third quarter. Gronkowski hasn't been himself this year, but he came through with three big catches for 97 yards against the Chiefs, including a 39-yard grab on the game-winning drive. Gronkowski has only broken 60 receiving yards in a game once since Week 6, and he will be used as a blocker a lot to help the running game. Still, when the season's on the line, he's likely someone the Chiefs will have to deal with, so Berry could help there even if neither player is at 100 percent. The Patriots are too smart and experienced to look as bad as the Colts did last week, but the Chiefs have the natural pass-rushing talent and will play press-man coverage on the receivers to make Brady's job tougher. The Chiefs are one of six teams to play man coverage at least 50 percent of the time this season, and Brady only averages 7.3 yards per attempt against man coverage (ranked 19th), according to Sports Info Solutions. "Get pressure without blitzing and press the receivers" has been the strategy for years against New England, but for a change we'll see a team at home that will try to do exactly that. Much will be said about the coaching matchup in this one, but Andy Reid deserves a lot of credit for how he's attacked Belichick's defense with the Chiefs. The Patriots have allowed 40 points in seven games since 2000 under Belichick, and three of those games are to Reid's Chiefs. The only other time it's recently happened was the 41-33 loss to the Eagles in Super Bowl LII. Doug Pederson, who comes from Reid's coaching tree, was the coach for that one last February. Every week Mahomes seems to add multiple plays to his highlight reel, and his consistency is why this team has scored at least 26 points in every start of his career. It's a spectacular offense that also dominated situational football, ranking No. 1 in DVOA on third down and in the red zone. The offense was No.1 or No. 2 in DVOA at every depth level on third down. The Chiefs were also second in DVOA in late-and-close situations (the Patriots were third). Mahomes threw go-ahead touchdown passes against the Patriots and Rams this season, but the defense was unable to close things out. While the Patriots are this year's deadliest offense when using play-action, the Chiefs are No.1 in yards per play (8.2) without using play-action. How should the Patriots defend this offense? We know Belichick is famous for taking away one great player, but should that be versatile tight end Travis Kelce or speedy deep threat Tyreek Hill? Not letting Kelce eat them alive underneath like he did the Colts last week (108 yards on 10 targets) and forcing Mahomes to hit deep throws to Hill in the cold would probably be smart. Kelce has averaged 50.5 yards in the last two meetings with the Patriots, which is below his average production. New England in general has been good against tight ends in 2018, ranked eighth in DVOA. However, while the Patriots know Hill is uniquely fast, that hasn't stopped him from scoring a 75-yard touchdown in New England in 2017 and 2018. In fact, Hill has more 75-yard touchdown catches against the Patriots (two) than he has against the rest of the NFL (one) in his career. While Kelce's numbers were down, Hill had 133 and 142 receiving yards in the last two games against the Patriots. Sammy Watkins can be a wild card in this matchup. He has missed a good chunk of this season, but he returned against the Colts and had some positive plays before losing a fumble in the third quarter. He can be that third significant receiving weapon in this offense, and he drew the attention of New England's top cornerback Stephon Gilmore last time. Gilmore's charting metrics (No. 1 in success rate and No. 2 in yards per pass) are as good as any cornerback's this season, according to Sports Info Solutions. None of Hill's 12 targets (including three touchdowns) in Week 6 had Gilmore on him in coverage, so it will be interesting to see if the Patriots put their best corner on Kansas City's most dangerous receiver more. According to Next Gen Stats, the Patriots had a lot of success with playing press coverage this year, but Hill still had the highest yards per route (4.1) against press coverage since 2016. The Patriots finished second in DVOA against deep passes this season, but Mahomes has the arm talent to deliver again this week even in suboptimal conditions. Running backs have also been huge for Reid in the passing game, and that is especially true against the Patriots. Even in the 2014 matchup, Jamaal Charles caught two short touchdowns. Kareem Hunt got vertical on the Patriots for touchdown catches of 78 and 67 yards the last two years, but the team cut him in December. While that's a loss worth mentioning, it's not like the Chiefs haven't been able to replace Hunt without skipping a beat. Spencer Ware and Damien Williams easily have the most receiving DYAR in 2018 by any backs with fewer than 25 targets. The running back screen is still an effective play with anyone the Chiefs use. Williams in particular has taken over as the lead back and rushed for 129 yards against the Colts last week. As Warren Sharp recently noted, the Patriots have struggled down the stretch in runs out of 11 personnel, which would be a more attractive option for the Chiefs with Watkins back in action. Reid has proven going back to his Philadelphia days that he can work any back into an offense. Even in the 2014 win over the Patriots, Knile Davis rushed for 107 yards to complement Charles. The Chiefs shouldn't neglect their backs this week against a defense that ranks 19th against the run and 22nd against receiving backs. The Patriots played man coverage on 57 percent of snaps this year, the highest rate in the league according to Sports Info Solutions. That is preferable to just sitting in zone against Mahomes, but his numbers against man coverage are still quite impressive with 8.14 yards per attempt and 17 touchdowns to four interceptions. Some, including NFL Network's Willie McGinest, believe that keeping Mahomes in the pocket is key for the Patriots to succeed. That's not necessarily true. Mahomes did throw for 192 yards outside the pocket against Denver in Week 4, the most such yards in any game since 2009 according to ESPN Stats & Info. He has three of the top 20 games since 2009, including the 130 yards he produced from out of the pocket against the Patriots in Week 6. However, for the season Mahomes' passer rating (117.0) and QBR (82.3) inside the pocket were still second to only Drew Brees, according to ESPN Stats & Info. Dont'a Hightower baited Mahomes into an interception in Week 6 from the pocket, but the quarterback still functions from there at an elite level. It's just an added bonus that he can scramble and make things happen too, and mobile quarterbacks have given the Patriots their share of problems over the years. Pressure is certainly going to be important for the Patriots. The Chiefs allowed the fifth-highest pressure rate (33.9 percent) this season according to Sports Info Solutions. Mahomes holds the ball longer than most quarterbacks, but he doesn't take a lot of sacks, though he did have four against the Colts. Mahomes has also been credited with a league-high 16 avoided sacks (broken tackles), according to Sports Info Solutions. The Patriots were all over Philip Rivers prior to garbage time last week, but that was unusual success for New England this year. The Patriots called a pretty conservative game against the Chiefs in Week 6, bringing their second-lowest blitz rate of the season. The pressure rate on Mahomes was a fairly average game for both his season and the New England defense. Trey Flowers leads the way for New England with 7.5 sacks, but they're not going to be able to pressure Mahomes consistently like the Ravens did in Week 14. The Patriots have come away with multiple takeaways in 12 of their 17 games this season. The Week 6 meeting was one of four games for the Chiefs with multiple giveaways. Mahomes forced an interception before halftime in the red zone with his team trailing 24-9. Things can get easier for the Patriots with an early lead, but the Chiefs have spent the most time leading and the least time trailing this season. Finally, there is the peculiar split where New England's top eight games in defensive DVOA were all at home and the bottom eight were all on the road. Oddly enough, their pressure rate remains in the top four for both home and road, so it's not a crowd noise issue. Opponent adjustments hurt here as the Patriots had their five worst games on defense against offenses that finished 20th or worse in DVOA. Of the five games where the Patriots did not have multiple takeaways, four were on the road. The Patriots allowed more than 24 points five times on the road compared to twice at home, including the garbage-time scores by the Chargers in last week's 41-28 win. The Jaguars (31), Titans (34), and Dolphins (34) all scored their season high in points on the Patriots. That means Blake Bortles, Ryan Tannehill, and Marcus Mariota were among the baffling quarterbacks to have their best game of the season against the Patriots at home this year. Even Matthew Stafford and the Lions knocked off the Patriots in September. Detroit otherwise finished 0-7 in games against teams with a winning record. That's a bad resume to go up against a quarterback that already scored 40 points in the last matchup. In the last 10 seasons, the Patriots are 8-19 (.296) on the road when allowing at least 26 points, or what we'll call The Mahomes Line. We have come to expect strong special teams play from both of these teams, but that hasn't always been the case this season. The Patriots finished 16th in DVOA (0.1%) and you would have to go back to 1995 to find the last time their DVOA was this low. New England has one of the all-time great kick returners in Cordarrelle Patterson, but still ranked 19th in starting field position after kickoffs (Chiefs were No. 1). The Chiefs were No. 2 in special teams DVOA, but surrendered a really bad touchdown against the Colts last week on a blocked punt. They too have a dangerous return man (for punts) in Tyreek Hill, though his only two big punt returns this season happened in the season's first four weeks. The kickers should be prepared for this matchup, though Stephen Gostkowski has Harrison Butker beat in experience with the playoffs and bad weather. By DVOA, the Week 6 matchup was Kansas City's second-best game on special teams this year and the second-worst for the Patriots. It was most notable for the breakout game by Kansas City rookie kick returner Tremon Smith. He had a 97-yard return in the fourth quarter, and the Patriots were the worst team this year in our metrics for kickoff coverage. One thing we almost never saw in that game: punting. There was one punt (by the Chiefs) in the whole game and the Patriots had zero accepted penalties. Expect a few more of both this time around. This is the biggest game for the Chiefs since the 1970 merger, so there is definitely pressure on the home team to come through. Home teams are on a 10-0 run on Championship Sunday, with the last loss happening to the Patriots against Baltimore in the 2012 season. Since 2001, the Patriots are 16-1 in the playoffs against new opponents and 12-9 in rematches from the regular season. Last week, the Chargers didn't look like they had a clue on how to handle the Patriots on either side of the ball. The Chiefs will be prepared, and their offense has been the most reliable unit in the league this season. The weather doesn't seem like it will be anything abnormal, and the defense getting Houston and possibly Berry back could really pay off for this matchup. Despite the way the Patriots are trying to sell themselves as the underdogs, no one should be surprised if they win this game. Brady against a defense that allows the most yards and fifth-most points per drive always sounds like a favorable matchup. Belichick has faced historic offenses before and knows the value of possessions. He may even take the ball first again this week if the Patriots win the coin toss. It takes an exceptional performance to beat the Chiefs this year. While the Patriots have done it once and are capable of doing it again, their performances on the road have left a lot to be desired. All-time great quarterback seasons rarely lead to rings, but they do often get to the Super Bowl. This just feels like the time for Mahomes and the Chiefs to break through, and if they do, a gift should be sent to the Dolphins for the Miracle in Miami play that helped put this game in Arrowhead rather than Gillette. Patrick Mahomes is trying to match Kurt Warner's accomplishment from '99. Warner is the only QB ever to throw 40+ TD passes in the Reg. Season and then win the S.B. that same year. Chiefs are going to have to get Pats in 3rd and long situations for the pass rush to be effective. Brady just gets rid of the ball too fast otherwise, which is what had the Chargers so frustrated last weekend. That means stopping the run effectively. Berry is the key to that. He is, without a doubt, the best run defender KC has. Still, as much as Belichick's gameplans tend to instill fear into opponents, I think Andy gives him nightmares. Chiefs have averaged over 35ppg against the Pats since Reid arrived. I'm really looking forward to this matchup between two of the best coaches the NFL has ever seen. Does this game set a record for combined yards by TEs? Only if Bill has decided that Gronk is going to be his X-factor this game and has TB throw to him a LOT more than usual this year. Record is 297 yards, so far as I can tell. New Orleans-San Fran 2012. It's possible, but it would require Kelce to go off, too. Graham and Davis six years younger and healthier, yeah, that's a lot of TE talent, and certainly a ton more raw speed than this game. Thanks for looking those up. Why did the Chiefs play at the Bills in 1966? Originally, the hosting of Championship was alternating between Eastern and Western division. I was hoping to get more wind than the 10-15 m.p.h. forecast. Still, with the kickoff around sundown, the forecast wouldn't have to be that off, for the wind to get above 20, which might give Mahomes an edge on ol' soft balls. On the other hand, also KC seems to be getting back the players at the right moment. So the tape incident was great for the Pats. Still, HFA is huge, Pats on the road were a mess this year (the freaking Miami last play) and I can only see KC as a big big favorite. It's been a weird season for the Pats' injury list. Almost their entire draft class was on the IR before the season even started, with the notable exception of Sony Michel. Many key contributors wandered on and off the injury list in the middle of the season, including Marcus Cannot, Gronk, and Brady himself. Hunt repeatedly torched the Pats. I'm not convinced Williams can play at the same level, esp. as a receiver. I wouldn't automatically transfer any impression of how the Pats played on the road this season to how they will play in KC. A key question is why they played so poorly in Detroit, Miami, and Tennessee. (I know they also lost in Pittsburgh, but their effort was respectable that day. I have mixed feelings about the loss in Jax.) Do we think the Pats will play with as little focus as they did in Detroit? That they'll be physically pushed around as happened in Tennessee? That they'll forget to play all 60 minutes as happened in Miami? Certainly a pattern of sub-par focus is troubling, but I don't think that should be a problem on Sunday. The Pats may well lose, but it shouldn't be because they just forgot to show up for the game. We haven't seen that particular problem in the playoffs since their back-to-back first round exits in 2009 and 2010. Focus was part of the problem with Detroit, but watching that game, I was struck by how slow New England's defense looked, especially the LBs. If that NE defense shows up, they're going to have all kinds of problems with KC. No outcome, either team wins a close one, or either team wins a blowout, would greatly surprise me. It's tempting to think the Pats aren't going to go on the road and get a stomp, but it really wouldn't be a shock for a young qb, even one as talented as Mahomes, to make some bad mistakes in his 2nd playoff game, which lead to some easy scores for the Pats. The only thing that would surprise me would be a low-scoring, defensive struggle. This won't end 6-3. That's the way I feel about this game, as uninteresting and uncommittal as it sounds. I'm hopeful that Mahomes, under the guidance of Reid, will continue to play well, but as you say, there is not the large body of work there to eliminate the possibility of a meltdown-type game. As much as anything, Mahomes shares the trait of pretty much all mobile young QBs of occasionally putting himself a little too much in harm's way, and has flirted with getting injured at times this season (indeed he did so last week). New England will obviously come prepared to take advantage of any mistakes, whilst not making mistakes of their own. The offence is still capable of sustained periods of immaculate execution, whilst the defense carries out a game plan, as we saw last week. But there is no way of disguising the fact that, over the season, this isn't a vintage Pats squad. And they shouldn't carry their usual enormous coaching edge into this matchup, at least not in terms of preparation. 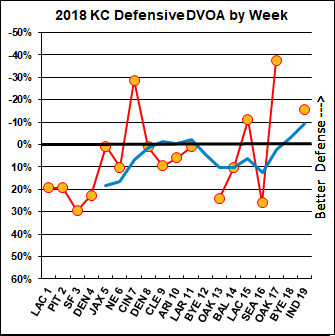 I can't be bothered to look at what DVOA says, so I could be completely wrong, but it feels as though the Chiefs are carrying almost all of the variance into the game. They could blow the doors off, connecting with multiple huge plays, or they could turn it over multiple times whilst playing non-existent, self-defeating defense (they lead the league in penalties). If I had to bet I'd take the Patriots with the points, because it is always hard to get your head around the Patriots getting points. But considering rationally, I don't think there is an edge there. It can be easy to overrate the solid, consistent performers, ahead of the opponent with higher volatility in any sport. But the Chiefs clearly have an extra gear on offense, which if clicks, at home, the Patriots are going to find it hard to live with. I honestly don't see how NE wins this game. The KC defense played well last week, and I expect them to again this week. Even if they don't, KC has a very good chance to outscore NE. I think Belichick will come to the same conclusion, which is why I wouldn't be surprised to see NE come out and deploy a 2003-playoffs-vs-Indy-level blatant defensive holding-on-every-play approach. I'm fairly serious, I think. Belichick is nothing if not pragmatic, and how he keeps KC from getting to 30-35+ without that, I have no idea. If NE can do it playing straight-up-ish, more power to them, but I think they get smoked here. I think that strategy works better against the statuesque Manning/Warner types than the more Rodgers/Favre mold of Mahomes. They win if Mahomes has a bad game, perhaps because Belichik confuses him a few times, while Brady shortens the game. If Indy's receivers had played better, the Colts would have made the game competitive; it wasn't as if the Chiefs defensive front whipped the Colts offensive line. Mahomes has 18 starts and fewer than 500 attempts in his career. That's fairly inexperienced. Am I expecting him to have a bad game? No, of course not. Would I be really surprised, however, if a guy with fewer than 500 career attempts played poorly in his 2nd playoff game? Not at all. Nah, defensive holding-on-every-play requires refs' Gillette home cooking. Well, NE has been to the past 2 SB's with many of the same players and are healthier than any time in the past 3 years. You could go back to 2014 and say that NE should have been to every SB, won then all if healthy and not much is different. I personally think the 2015 team could have gone 19-0 if they didn't suffer injury after injury every week until they were a shell in the AFCCG AND THEY STILL COULD HAVE WON. This years team is better than last years at OLine and DBs, things that caused problems in last years SB. Matter of fact I believe they have the best remaining Oline and DB groups of the 4 teams. I'm sure if you went back and replayed all of those games, Denver would have appreciated healthy-Manning back, Seattle would have appreciated any able-bodied men in their secondary and D-line, and Philly would have had Wentz, Peters, Hicks, and Sproles. Yes, the ability to get past injuries is key in any playoff run. I think the point about the Pats in this context is that they had abnormally bad injury luck in 2015, compared to abnormally good injury luck in 2014 and 2016 when they won Super Bowls. They also have good injury luck right now. So they should have a fighting chance, even though they're on the road. They had no one on their injury list for the SB last year. Nor did Philly. But that's a misleading stat. Both teams had four starters on IR. You have aptly rebutted my comment referring to a statistic that I wasn't citing as its basis. Why did you do that? I didn't say "a perusal of the injury list shows that the Patriots are healthier this year than they've been in years past." So why pretend that I did? "They also have good injury luck right now." Why twist your own words? Anyway, I think the point was that they had no worse injury luck last year than the Eagles. You know, no excuses. It's pretty easy to write a script for the Pats winning the game. They use a running game, similar to what they used last week against the Chargers. The Chiefs had the worst run D in the NFL this season. So all you need to think is that the Pats exploit that weakness better than the Colts did. The Pats dominated the first half of the game in Foxboro this season. So all you'd have to do is go back and look at how that developed to see the start of the game. And then imagine a second half with the Chiefs doing a typical playoff fold or Reid doing his usual clock management shenanigans. I'm not saying that will happen. I have no idea what will happen. The two teams seem pretty evenly matched and I'm not counting on any coaching blunders. A couple turnovers on either side could turn the game into a rout either way. Neither team is "historically great", but there aren't any historically great teams this year, so either could win the Super Bowl. It seems like everyone is forgetting that Belichick got Mahomes for 2 picks on simple zone blitzes in the first meeting, and Mahomes looked lost until a series of giant plays (99 yard kick return, sack-fumble, and >60 yard bombs to hunt & hill respectively) got them back in in the second half. 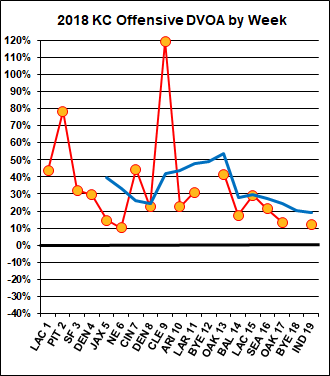 Obviously KC has an extremely explosive offense and could go off and win, but I see no more credible reason to believe that the big plays that turned the last matchup from a blowout to close game are more repeatable than all the things that got KC into a big hole in the first place. 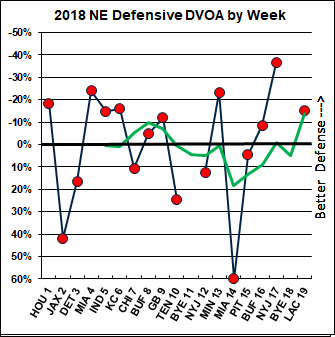 The fact that NE's weighted DVOA is much higher than overall DVOA (and the loss of Hunt) suggests to me that they are likely to have even more success limiting the KC offense this time than last time despite being on the road. In my view this game revolves around the question of whether Tyreek Hill & Sammy Watkins can have enough explosive plays to make an offense that seems likely to struggle to move the chains work (Kelce has had very limited success in matchups with NE) - I doubt it, but we'll see. But in Mahomes worst game of the season in terms of ball security (5 TOs), he still put 51 points up against LA on the road. LA's defense and offense are comparable to NE's. If anything, it's a team better built to grind out a game. But even that's not bulletproof. Baltimore tried that with a better defense and a more determinedly run-oriented offense, and KC still ran more plays and had the ball more. You may just need to outscore them. I've looked that game up and down and it's almost worthy of an analytics article all it's own. The weird way the Rams offense played is definitely a huge story there (they had 4 quick punts and two fumbles and didn't manage the clock to get an extra drive at either half-end, but still scored 47 points + the defensive score). I really doubt the Pat's will push the pace like that and expose their defense to chasing Tyreek Hill as they start to tire unless they make some turnovers early like the Atlanta superbowl. It should be really interesting though. If it wasnt for Vinatieri's missed kicks, it would have been a one-score game in the 4th, and that's with Luck playing like trash for most of the game. Unless you think the Colts were a lot better than the Patriots on both sides of the ball, I don't understand how you could think NE has no chance unless they hold everyone on D.
It's funny how people continue to buy Speaks' post-game whining that he 'didn't wrap Brady up for fear of a penalty.' If you watch the play however - as I did multiple times in slow motion - it's simply the case that Brady stepped forward just before Speaks made contact and Speaks wasn't able to change the momentum of his very large body in time. In short: he missed. Brady is no Rothlisberger but he's got excellent pocket awareness and is big and strong enough to shake off a lineman who doesn't nail him dead on. While I'd love a repeat of last week's Patriots blowout, I certainly don't expect it. Reid has schemed well for Brady and Co. over the years and he has the best offense of his coaching career. The best hope for Pats fans might be a close game in which Reid's late-game clock management 'skills' come into play. 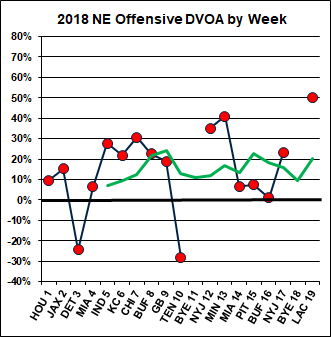 The trend lines in New England's graphs look messed up -- it looks like their Wild Card week bye might have been counted as a game in which they had a DVOA of 0%, instead of a null data point. Andy Reid’s offences have historically turned the ball over very, very little. If there is one thing that marks his tenure as KC HC it is the huge positive turnover differential the team has maintained. Clearly this offence and what is at stake in this game is a little different to most of his previous games, so it’s certainly possible that turnovers occur, but viewing it as a path to victory for New England is clutching at straws somewhat. The Patriots have gone very pass heavy in all of their recent playoff games going back multiple seasons. Brady’s recent playoff numbers are absurd, and this continued last week. Evidently they know this is how to play optimally, when the stakes are highest, and any considerations about looking after Brady’s body go out of the window. They project to be able to run the ball well against the Chiefs, but I fully expect them to pass early and often. KC 35, NE 28. NE trails by 10-14 for most of the game, scores a late TD to make it a 7pt game but fails to recover the onesides kick and KC kneels it out.